Rajasthan, as the name suggests is ‘The Land of Kings’. Historically, it has been the abode of many brave kings of this country. It has witnessed their brave deeds first hand and so it remains soaked in the sagas of their glory. Rajasthan is also 'The Land of Colors' and one of the most captivating states of India. Perhaps, because it hosts a vast, diverse tribal population in its artistic regal architecture. Tourists and vacationers come up-close with the rich culture, tradition, heritage, and monuments of Rajasthan. From the moment you step in, we are sure you will get drenched into the royal grandeur of this state. This itinerary is even special because every night you sleep in the rooms of a palace like kings and queens of your era at some of the best heritage hotels of Rajasthan. If you plan your trip between 08th -15th November, then you get to join the glorious celebrations at The Pushkar Camel Fair. For its unimaginable scale and grandeur, it is rated as one of India’s top-rated travel experiences. NOTE: On popular demand we now offer Taj Mahal itinerary as an add-on to Royal Rajasthan itinerary. You arrive at the Udaipur airport today and get transferred to the hotel. Throughout these first two days, we will see how Udaipur itself wears many colors of Rajasthan. This afternoon, we take you on a half-day guided walk to the largest and most beautiful, Indo-Aryan Lord Jagadish temple (built in the year 1651). Next, we move on to the Udaipur City Palace, one of the architectural marvels of Rajasthan, located peacefully on the banks of Lake Pichola. You may choose to take an optional boat ride in the pristine blue waters of this lake. Today we explore this ‘City of Lakes’ by pedaling along the countryside. The rural landscape of this state has a magic of its own. Have your breakfast, take tips for safe riding from your trip leader and get ready to ride! We cycle into a typical Rajasthani village where mud-houses, farmers-at-work and women in their bright-colored attires are seen busy making their handicrafts. This is an arresting sight for first time visitors of this country. We also say hello to the kingfisher birds, langurs, cows, goats and peacocks as we ride our bikes alongside Lake Pichola, Badi and Fateh Sagar. In the evening, we go for some colorful street shopping. It is an electrifying experience to walk on the never-ending streets splashed with bright textiles, miniature paintings, silver jewelry, ethnic bags and more. At the end of these two days, you’re not sure what to call this Citadel of Mewar (a kingdom ruled by the Sisodia dynasty for 1200 Years) - 'The City of Lakes' for its picturesque lakes, or 'The City of Romance' for its palaces and marvelous architecture or else 'The City of Colors' for its music, art and culture. We start early today and drive out of the city for half an hour to avoid Udaipur city traffic. Your ride starts from Iswal and we cycle till Kumbhalgarh. As we ride into the mountains they take us close to Aravallis and the terrain keeps getting challenging. On the way, we witness the lifestyle of Bhil tribals - an indigenous tribal people of India and one of the oldest inhabitants of the subcontinent. In the evening, we visit the Kumbhalgarh Fort that sits peacefully at the hill-top. Along with five other forts in Rajasthan, it was declared a UNESCO World Heritage Site in 2013 under the group Hill Forts of Rajasthan. Get ready to experience one of the most scenic rides of this trip as we ride down the Aravalis. We perform daring maneuvers and cycle past Dhok trees (Anogeissus Pendula) on a strewn topography. Enroute we may see camels and blue bulls as you ride past swaying masses of yellow mustard and wheat. The Dhok plant splashes some green on the pale brown stretches along the way. We bike past the rugged Aravalis, downhill near Desuri village and largely remain on a flat terrain before reaching the Garrison Fort of Jojawar, a.k.a Rawla Jojawar, this fort is now converted into a heritage hotel which is where we will rest tonight. We start early and cycle past the lush millet vegetation, carpets of yellow mustard fields and some amount of wildlife too - deers, black ducks and camels to reach Jodhpur. On the way get to view the Sardar Samand Lake Palace and the site of the first Chipko Movement, Khejarli village. After riding 30 mi/50 km we finally reach the ‘Sun City’ of India. However, we now start noticing the colorful topography as you see blue painted houses basking under the bright yellow sunlight to strike a contrast with the pale sand brown color of the city. Hence, Jodhpur is also referred to as the ‘Blue City’ of India. DID YOU KNOW? 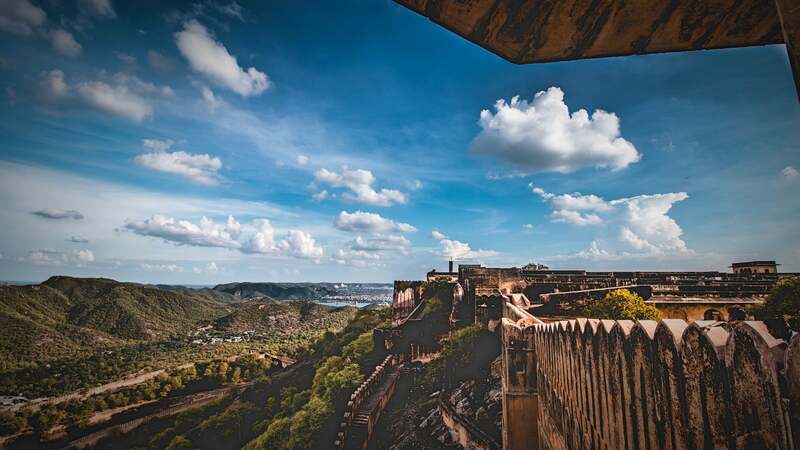 Jodhpur is the ‘Sun City’ of India for the bright, sunny weather it enjoys all the year round. It is also the ‘Blue City’ for the old city area where most traditional people, and especially the priests have painted their houses with blue, an auspicious color, also known to keep the termites away and the houses cooler during scorching summers. Colorful Jodhpur too, isn’t it? Today we will ride on a flat terrain to pass the Indroka village. We only ride until Tiwari village and then take a short drive to reach the Osian desert. It is an oasis in the Thar Desert, and has been known as the ‘Khajuraho of Rajasthan’ for its temples. In the evening we visit The Lord Mahavir Jain temple that stands out for its ancient architecture and enjoy the cultural folk dance and music by the sand dunes of Osian. Tonight we rest at the Reggie's Camel Camp, a luxury tent resort near the small village of Osian. As we ride pass a plethora of colorful villages, we get the real taste of Rajasthan’s countryside. Most of the roads in Rajasthan are made of asphalt. Today, as we ride through small villages you witness roads that are either broken or have been cobbled, thus making it difficult to use road bikes. So we provide you with mountain bikes to make the ride easy. We will also experience Rajasthan’s countryside firsthand and encounter pink-turbaned men, women carrying fodder in colorful skirts and camel carts plying along the roads. We ride through few villages and then we drive you to the 400 years old, Hotel Fort Khejarla, an outstanding example of Rajasthan’s royal architecture that rises up from the desert like a sunbeam. After breakfast we make an early start to leave for Pushkar, situated at the shore of Lake Pushkar, it is one of the oldest cities of India. The rural terrain is challenging for pedaling especially, near the talcum plantation. Steep walls along narrow lanes, shops overflowing on to the street, animals everywhere, open septic drains, children playing, old people resting on the roads - is the sight of real rural India but poses difficulty in cycling. We pedal until Banjakudi and then take a support vehicle till Pushkar. If arriving between 08th -15th November, late afternoon we get to participate in the grand celebrations at the annual Pushkar Camel Fair. Apart from the buying and selling of livestock, it has become an important tourist attraction and known to attract thousands of people, camels, sheep, cows and goat from across boundaries. Today we ride out of the ‘Holy City’ of Pushkar and take our final ride to the ‘Pink City’ of Jaipur. The support vehicle will take us to the ancient capital Amber, a popular host to the Amber Fort. It is important that we reach Jaipur by 9:30 am so that we can take an elephant ride to the Amber Fort situated on the hill before the last ride closes down at 11 am. Later on, we visit the City Palace, Jantar Mantar (Solar observatory) and enjoy panoramic views of the Hawa Mahal (Palace of Winds) and Jal Mahal (Palace on Water). This day brings us to the end of romance and grandeur, culture and tradition, color and compose of Royal Rajasthan as we bid adieu to the crew and this place. Once you have traveled through Rajasthan, you realize that the voyage never ends, but it is played out over and over again in the quietest chambers of your mind that it can never break off from it. You board the morning flight to Delhi as our shuttle drops you to the airport.